Tired of creating Splitpanes within Splitpanes, the Java way. Here’s a much simpler way to get what you want in ONE widget, with very little programming involved. I’ve called it the VimSplit since its inspired by Vim. Of course, you can expand and contract them. You can stack more. Much simpler than the earlier SplitPane which i hope to throw out the window. Change one character, and it the same screen goes from a Vertical split to a horizontal one. rbcurse has a progress bar – 2 styles, one is the colored one, and one the “classic” style. 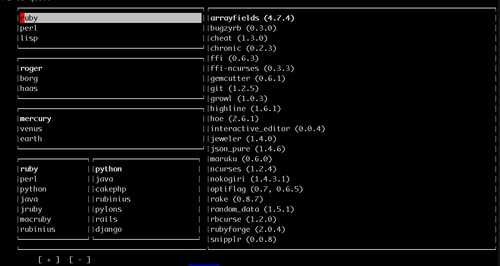 First I integrated the excellent terminal-table. However, I had to make changes to that gem, and that meant installation issues and keeping it up-to-date. 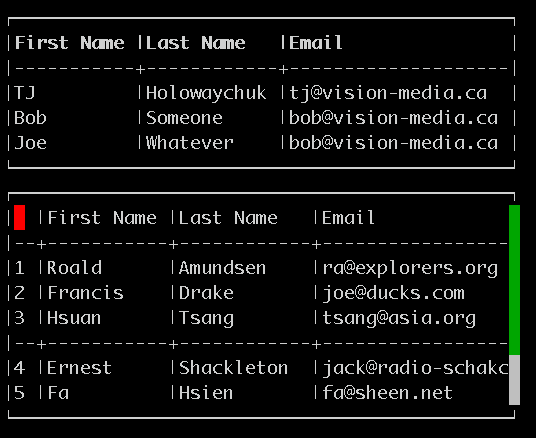 So i’ve hacked a simple table display in a small file, which i can use for most table data. Easy to maintain, and easy to debug or modify! I’ve attached it to a listbox and to a textview. I might give it its own simple widget which is aware of columns without getting into models, renderers etc. 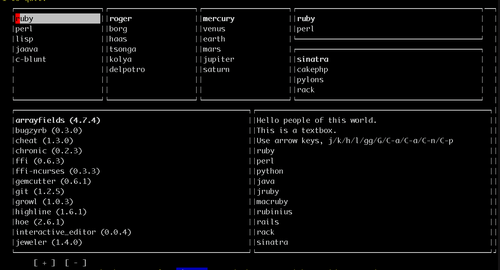 The syntax from terminal-table is supported, I’ve used their examples. It does not do colspan, and center alignment. Enjoy. Ruby rocks! 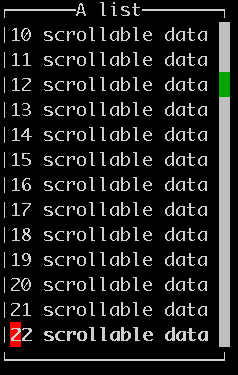 So this scrollbar takes its coordinates from the parent, and registers itself as a listener to its traversal event. So now its ready to display and move around as the user moves down his list.